Andrei Vasilevskiy will return to the NHL after missing the start of the regular with a blood clot. The Tampa Bay Lightning’s backup goaltender, who started one game in Tampa’s 2015 Stanley Cup Final loss to the Chicago Blackhawks, underwent surgery in early September to remove a blood clot near his left collarbone and needed treatment for a type of vascular thoracic outlet syndrome.The procedure was performed by Dr. Karl Illig, Director of Vascular Surgery at Tampa General Hospital. He was supposed to miss two-to-three months with the issue. 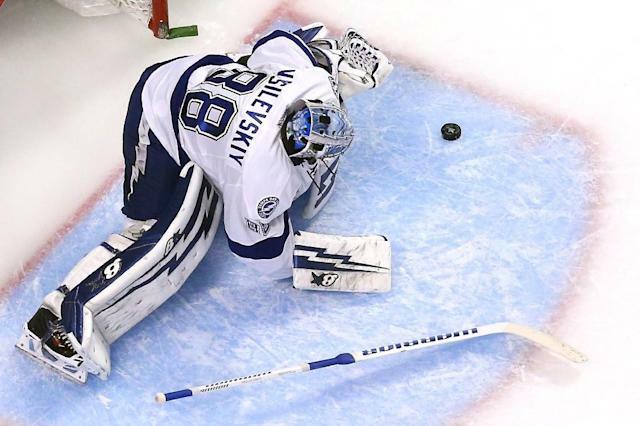 Tampa Bay sent Kristers Gudlevskis to the American Hockey League’s Syracuse Crunch to make room for Vasilevskiy. Vasilevskiy played two games with Syracuse where he stopped 56 of 58 shots on goal on a conditioning stint. According to Syracuse.com, Vasilevskiy went on blood thinners to help alleviate the issue. He was cleared for full practice last Monday. His work to get back to this point sounded tedious. Again per Syracuse.com. Last season, the 21-year-old Vasilevskiy went 7-5-1 with a 2.36 goal-against average and .918 save percentage. The 19th overall pick in the 2012 NHL Draft. Vasilevksiy was supposed to see more work this year to help starter Ben Bishop. "You just don't sit here and say Bish is going to play 60 plus games and and Vasy is only going to play 10 of them," Cooper said. "The whole point of this is to have a one-two tandem and in a perfect world a 1 and 1A tandem. Vasy needs games. Part of this is that he's an NHL caliber goaltender. He's going to be a really, really good one. But he needs games to play. In his one Stanley Cup Final start, he stopped 17 of 19 Blackhawks shots on goal in a 2-1 Game 4 loss.